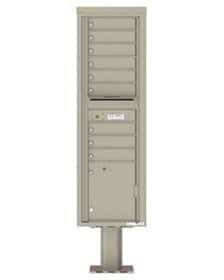 The MailboxWorks carries centralized, pedestal mounted, cluster commercial mailboxes by Auth Florence Manufacturing. These 4C mailboxes offer the perfect finishing touch to the outdoor space of any multi-family apartment complex or multi-tenant office dwelling. USPS approved, pedestal 4C mailboxes are available in a wide range of sizes including from 1 to 7 tenant doors (with parcel lockers) up to 16 – 20 tenant doors (also with parcel lockers). In 2006, USPS implemented the Standard-4C Regulation (STD-4C) in order to improve mailbox security and accessibility. The STD-4C regulation requires that all post mounted or pedestal mounted commercial mailboxes installed as part of a major renovation (or new construction project) meet these new 4C requirements. In compliance with these laws, all Florence 4C Pedestal mailbox units are approved for use by USPS. Please note that you must still receive local Postal permission for installation and usage of 4C pedestal mailboxes. These 4C pedestal mailboxes provide ultimate durability in order to withstand all weather conditions. The corrosion resistant weatherproofing ensures the 4C pedestal mailbox unit maintains its new condition for years to come. Since 4C pedestal mailboxes and versatile 4C mailbox suites utilize the same mailbox units, the same Florence Manufacturing 5-year Product Warranty also covers 4C pedestal mailboxes. This warranty begins from the product’s purchase date and warrants the unit against any defects in workmanship, materials, or manufacturing. For more warranty details see the Florence Product Warranty PDF file. All Florence 4C pedestal mailboxes include the standard 1.5 x 1.75 inch silver decals for mailbox door identification. These are sequentially numbered so that the privacy and safety of mailbox tenants remains protected. Upon request, The MailboxWorks can also do custom engraving. Engraved 4C pedestal mailbox door numbers can be unfilled or come with white or black filling. Florence Manufacturing’s new 4C series commercial mailboxes are designed to meet the updated USPS regulations that have stricter security standards. 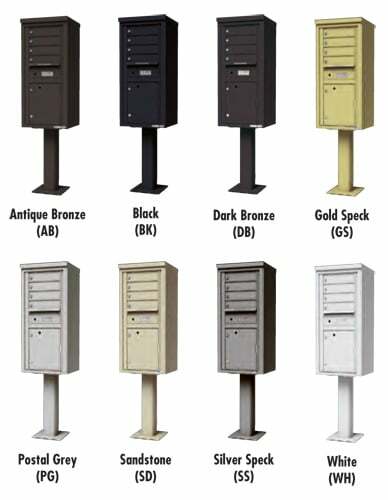 Although Florence 4C pedestal mailboxes can be used for private mail distribution and for the pedestal applications, they would require local post master approval for USPS mail delivery service. These units provide the same security features and options as all USPS approved wall mounted versatile 4C mailboxes. All models of 4C mailboxes can be mounted upon a pedestal and be used for any indoor or outdoor application that requires mail delivery service. When used as private distribution mailboxes, they are typically utilized on college campuses and for university mail distribution centers. You can also find them in any military, government, hospital, or other commercial business applications that require private mail distribution only. When used for private mail delivery, your new 4C pedestal mailboxes can be ordered with an optional master commercial lock on the master access door. The master lock ensures the mail distribution center has easy access to all mailbox compartments at once. Private mail delivery centers don’t have the same height restrictions (or have to adhere to USPS regulations or accessibility standard). Therefore, you have more flexibility when it comes to the height when you buy 4C pedestal mailboxes for private mail distribution. All 4C pedestal mailbox models are designed so that once the 4C mailbox unit is mounted on the mailbox pedestal, the unit will still be at a standard accessible height. You can buy 4C pedestal mailboxes as single wide mailboxes or as a double wide mailbox unit. All the same versatile 4C mailbox accessories will work with 4C pedestal mailboxes. Florence 4C mailbox replacement parts and accessories are available online through The MailboxWorks. 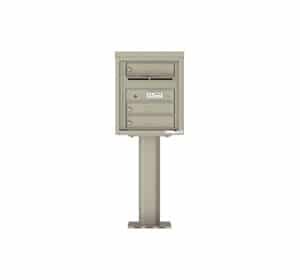 Florence 4C pedestal mailboxes can be installed on a new concrete base or an existing concrete base, both of which requires a minimum width of 47 inches and a minimum thickness of 4 inches. Install the mailbox pedestal base to the 4C mailbox unit first, before the entire 4C pedestal mailbox is installed to the concrete foundation. Florence 4C pedestal mailboxes are offered online through The MailboxWorks at prices below the manufacturer’s recommended list price. However, we do offer additional bulk order discount pricing on 2-6+ units. Ask us about additional discounts on orders of 6 or more units. The MailboxWorks offers Free Shipping within the continental United States (unless otherwise stated) with each 4C pedestal mailbox purchase. Your order will be shipped directly from Florence Manufacturing using common carrier delivery. Delivery times may vary depending upon where you are located. Standard 4C pedestal mailbox orders generally ship within 2-3 weeks with an expected delivery time of only 1 – 5 business days from the shipping date. Florence front loading 4C pedestal mailboxes are shipped in two packages, with the mailbox pedestal shipped in its own packaging. The mailbox pedestal package includes the pedestal, a rubber installation pad, and a template for locating the positioning of the anchors for the pedestal. The 4C mailbox package includes the 4C mailbox unit, tenant mailbox keys (and parcel locker keys, if applicable), plus the mailbox door identification tags. NOTE: Florence Manufacturing does not include the 4C pedestal mailbox installation anchor bolts. These will need to be purchased separately and will depend upon the type of installation that is chosen. With new doors sizes, a variety of mailbox configurations, and multiple powder coat finishes, the design options are endless to fully meet all of your centralized mail delivery needs. See our new 4C Door Sizes for even more options! Our mailbox support staff at The MailboxWorks is always available to help you design a custom configured pedestal mailbox unit that meets your exact mail delivery requirements. 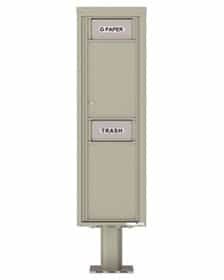 Email to inquire about commercial 4C pedestal mailboxes for sale. Sign up for our newsletter to get inside MailboxWorks coupons and specials. Note: Many of these FAQs and answers also apply to the versatile 4C Mailbox Suites and CBU mailboxes. What are my options for 4C mailboxes? 4C pedestal mount mailboxes consist of a finished cabinet surrounding the 4C mailbox unit that is installed on a pedestal stand. The pedestal stands can be installed on a concrete slab for outdoor installation. Recessed 4C mailboxes consist of a 4C mailbox that is installed indoors into an opening within a wall. The opening in the wall is made to fit the exact size of the mailbox unit and the mailbox sits flush with the wall. Surface mount 4C mailboxes consist of a 4C mailbox in a finish cabinet that is installed indoors on a flat wall surface. The surface mount mailbox will sit proud from the wall. Does the pedestal 4C mailbox need to be USPS approved? Yes. Just like all centralized mailboxes serviced by the USPS, your 4C pedestal mailbox must be USPS approved. Your local postmaster will need to approve any 4C mailbox prior to it being installed on a pedestal. What makes a 4C pedestal mailbox “USPS Approved”? USPS approved means that the mailbox has gone through rigorous testing and approval by USPS prior to being sold in the marketplace. Look for the “USPS Approved” credentials for any mailbox you purchase for centralized mail delivery. Are there requirements for the placement location of a new or replacement 4C pedestal mailbox? Yes. You should contact your local postmaster who can instruct you on where to install the new commercial mailbox given your specific requirements. Based on new USPS regulations, what kind of cluster mailbox unit is needed for my replacement? Is the installation for a new construction project? a) If yes, USPS requires a 4C rated pedestal mailbox or freestanding CBU. If renovating, will the new mailboxes be used as replacements in the same rough opening (RO)? a) In this case, 4B+ rated vertical or horizontal mailboxes can be used. b) If you are changing the RO, 4C rated mailboxes must be used. If you are limited on wall space you may consider mounting CBUs or 4C mailboxes outside. Always consult your local Postmaster about placement location. Is the community mailbox installation inside or outside? a) If installed inside, any community mailbox model can be used depending on your answer to question 1a and 2a/b above. b) If it’s an outside installation (and unprotected), install CBUs, 4C mailboxes, or 4C pedestal mailboxes, as the 4B+ mailboxes are NOT rated for outside use. If you are still unsure what type of 4C pedestal mailbox meets your requirements, contact your local postmaster. Can I just ask my local letter carrier about new or replacement 4C pedestal mailboxes? Your letter carrier will likely not be able to answer your questions. Please contact your local postmaster instead. I have an old pedestal on my property. Can I use this? We strongly discourage using an existing 4C mailbox pedestal because it may not be strong enough or have corrosion issues. This could cause the 4C mailbox to collapse and pose a dangerous threat to your USPS mail carrier, tenants, and bystanders. Your new 4C mailbox unit can weigh 240lbs and needs to be supported by a new pedestal. NOTE: INSTALLING OR MOUNTING YOUR 4C MAILBOX ON ANY PEDESTAL OR SURFACE OTHER THAN THE FACTORY SUPPLIED PEDESTAL CAN VOID YOUR LIMITED MANUFACTURER’S WARRANTY. Do I have to use the factory-supplied pedestal? We strongly discourage customers from using any other pedestal than the pedestals that come with 4C mailboxes. These are specifically designed to support the 4C mailbox unit. Furthermore, if you choose to use any other mounting method you will need to consult and get approval from your local USPS Postmaster. Using any surface other than the factory supplied pedestal can void your limited manufacturer’s warranty. Can I choose the height of the pedestal 4C mailbox? No. You must install the 4C pedestal mailbox at the exact height requirements, as specified by the USPS. Does my 4C pedestal mailbox come with everything needed for installation and usage? Your 4C pedestal mailboxes will come with everything needed for installation with the exception of 2 items that USPS requires are sourced directly through USPS: USPS Arrow Locks and Anchor Bolts. What are USPS Arrow Locks and why doesn’t my 4C pedestal mailbox come with these? 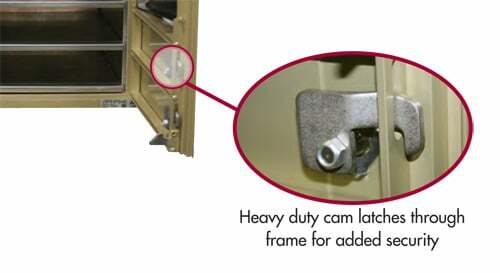 USPS arrow locks are installed on the outdoing mailbox door and parcel locker door(s). For security purposes USPS restricts factories or any other non-USPS employee from possessing these master locks. Where can I get the USPS arrow locks I need? Once you install your new 4C pedestal mailbox contact your local USPS. They will come to install the arrow locks and typically do not charge for this service. What are anchor bolts and why don’t they come with my 4C pedestal mailbox? Anchor bolts are used to mount the 4C pedestal mailbox to the concrete. Each pedestal mailbox unit requires 4 bolts. USPS specifically requests that mailbox distributors like The MailboxWorks do not include mounting anchor bolts because there is too much variation from installation to installation. How do I know what anchor bolts are needed for my installation? Please refer to The MailboxWorks’ 4C Pedestal Installation Instructions to determine the right size anchor bolts for your installation. The factory suggests using ½-inch diameter L-Bolts together with a variety of expansion bolts. Where can I purchase the required L-Bolts and expansion bolts? Purchase the L-bolt anchor bolt kit online at The MailboxWorks when you order your 4C pedestal mailbox. The additional anchor bolts needed can be purchased at your local hardware store. What are the dimensions of the outgoing mail slot on 4C pedestal mailbox units? The outgoing mail slot is 3/4”H x 12”W. Is there theft protection on the outgoing mail slot on the 4C pedestal mailbox unit? Yes, a built-in aluminum comb on the outgoing mail slot will help stop mail fishing and removal of outgoing mail. Can I remove the outgoing mail slot if it is not needed? The mail slot and compartment cannot be removed from the 4C pedestal mailbox unit. 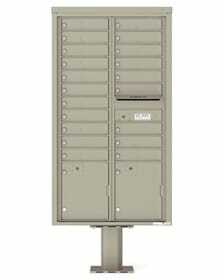 Can I add a private mail slot to a USPS 4C mailbox unit? No. Adding a private mail slot can compromise the security of your mailbox unit, giving opportunity for mail fishing. My new 4C pedestal mailbox is missing the tenant keys. What should I do? Remove the 4C mailbox from the shipping box and set is securely on a workbench or the ground. Open the outgoing mailbox door, which is below the outgoing mail slot on the right-hand side. Push up on the latch on the left side of the inside of the outgoing mailbox compartment with caution (the 4C mailbox will be top heavy). This will open the left side of the mailbox cabinet and give you access to all the tenant keys, hardware, and instructions. What should I do if the lock on the 4C pedestal outgoing mailbox is missing? This master lock on the outgoing mailbox is intentionally not included. USPS regulation requires a local USPS worker install these master locks, also referred to as “Arrow Locks”. What if I need to order a new lock for a tenant mailbox door? Please contact The MailboxWorks to order new tenant locks for your 4C pedestal mailbox. You may need to do this when a tenant moves out or the keys for the lock are lost or stolen. Do 4C pedestal mailboxes come with tenant mailbox locks installed? Yes. Each 4C pedestal mailbox comes with individual tenant locks installed and 3 keys per tenant mailbox lock. How can I get more than just 3 keys per tenant door? If you require more than 3 keys per tenant door please contact our customer service team by phone at 1-866-717-4943 or by email to discuss ordering up to 6 keys per tenant door. How much do additional tenant keys cost? Depending on quantity volume, each additional tenant key costs around $3.00. I already ordered my mailbox but no new additional tenant keys. What should I do? The MailboxWorks also sells additional blank keys that you can order and bring to your local locksmith or hardware store to have cut. Because key blanks for 4C pedestal mailboxes are proprietary it can be difficult to find these blanks at your local locksmith or hardware store. Please contact The MailboxWorks to purchase additional blank keys. We’d be happy to source the right type of key blank for your unit. How can I tell what tenant key blank I need? Will the same key blank work for all the tenant locks on my 4C pedestal mailbox? For the most part, Florence Mailboxes (the manufacturer of 4C pedestal mailboxes) will use the same key blank for the 4C mailboxes. However, this is not always possible, particularly on larger orders. Be sure to check each key before ordering key blanks for multiple tenant locks. 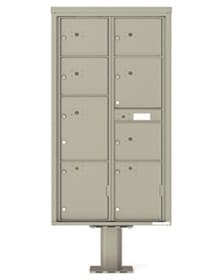 Parcel lockers are an additional compartment of a 4C pedestal mailbox used to deliver oversized packages that to not fit into individual tenant mailbox compartments. Are parcel lockers required by USPS? Yes. 4C pedestal mailboxes with more than 10 compartments must have a parcel locker. Are there any cases where USPS would waive the need for a parcel locker? Yes, if there is an alternate secure receiving facility (ex. a separate bank of parcel lockers), your USPS postmaster may approve the use of a 4C pedestal mailbox with no parcel locker. Please consult your postmaster for approval. How does package delivery to a parcel locker work? USPS mail carrier puts package into one of the parcel lockers. They also put a corresponding key tag and instructions into the recipient’s tenant mailbox compartment. When the tenant checks their mail, they will have the key and instructions to open the parcel locker to receive their package. Recipient opens parcel locker and removes package, leaving the key inside the lock (this is a captive lock meaning the recipient can’t remove the key once inserted). USPS mail carrier will remove the parcel locker key during their next mail delivery. What is a captive key lock? Captive locks retain the key once it is inserted into the lock. The key can only be removed by the authorized USPS mail carrier. 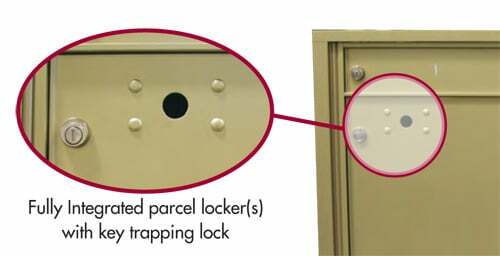 Why do 4C pedestal mailbox parcel lockers have captive locks? The parcel lockers on pedestal mailboxes have captive locks to prevent tenants from accidentally or intentionally taking the parcel locker key once they have removed their package. I don’t need a parcel locker. Can I convert it to an extra tenant mailbox? No. USPS regulation prohibits 4C parcel lockers from being altered in any way. Furthermore, the captive lock on the parcel lockers prevents this compartment from functioning as a regular tenant mailbox. Can I order 4C pedestal mailboxes without parcel lockers? 4C pedestal mailboxes with less than 10 tenant doors. 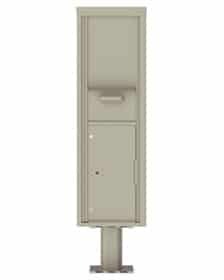 Large 4C pedestal mailboxes for use in locations with an alternate secure receiving facility that is approved by USPS. Can I order replacement doors and door pins for the 4C pedestal mailboxes? Yes, we sell replacement doors and hinge rods/pins. You can order these online at The MailboxWorks or by calling us at 1-866-717-4943. Can I order a 4C pedestal mailbox sign holder? Unfortunately, we do not sell plexi sign holders to attach to a 4C pedestal mailbox. What other parts can I buy for my 4C pedestal mailboxes? We sell a variety of replacement locks, key blanks, conversion kits, and decals to go with your 4C pedestal mailbox. Check out our entire selection here or call us at 1-800-824-998 for assistance. What are the options for customizing tenant mailbox doors? You can either engrave characters or add custom door decals. How many characters can be engraved on the tenant mailbox doors? You can engrave two lines on each tenant mailbox door, with up to 12 characters per line. How big are the numbers engraved on the mailbox doors? Each engraved character is ¾” tall. How many characters can fit on a decal? How big are the decals used for tenant mailbox doors? All mailbox door decals are 1 ½” x 1 ¾”. Why do 4C pedestal mailboxes take longer to ship that other CBU mailboxes? Each 4C pedestal mailbox unit is custom made to order compared to other CBU mailboxes which are typically pre-made and ready to ship immediately after an order is placed. The custom nature of a 4C pedestal mailbox requires extra lead time at the manufacturer’s level. How will my 4C pedestal mailbox be shipped? Box 1: Contains the pedestal and weighs approximately 25 lbs. Box 2: Contains 4c mailbox model and can weigh between 56 and 225 lbs depending on the unit size. Is there anything I should do upon delivery? When your new 4C pedestal mailbox arrives, we recommend that you confirm that you received the correct number of boxes. You should also reference the delivery receipt provided by the freight company that the number of boxes you receive agrees with the box count on the receipt. You should also carefully inspect the boxes for any visible damage before signing for the delivery. What if one of the delivery boxes appears damaged upon delivery? In the unfortunate incident that you notice a damaged shipping box you can refuse delivery of the damaged item (and not the entire shipment). If you refuse delivery due to damage please contact The MailboxWorks as soon as possible. What if I notice damage of shipping boxes after the delivery person has left? 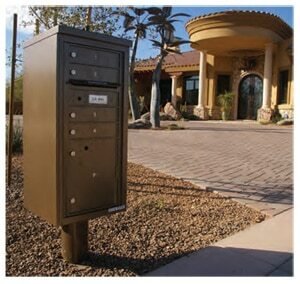 Contact The MailboxWorks at 1-866-717-4943 as soon as possible should you notice any damage to 4C pedestal mailboxes. We also suggest that you take pictures with your camera of any damage so it is documented for the factory and delivery company’s requirements. Open the outgoing mailbox door which is below the outgoing mail slot on the right-hand side. What is Centralized Mail Delivery? Centralized mail delivery means that a local mail carrier delivers and collects mail to a number of residents/businesses at one central mailbox unit rather than to individual addresses. What are the benefits of centralized mail delivery system to 4C pedestal mailbox units? Are 4C pedestal mailboxes designed for Centralized Mail Delivery? Yes. 4C pedestal mailboxes use the “clustered” style community mailbox design for centralized mail delivery. Do I need centralized mail delivery? We recommend consulting with your local Postal Authority near the start of your new residential or commercial construction project to determine whether you will need centralized mail delivery. Be sure to ask for your mail delivery plan that the U.S. Postal Service requires for your planned project. Do I need a STD-4C compliant mailbox system? How are the new STD-4C compliant mailbox system different from previous mailbox systems? Mailbox Shape – new flatter style horizontal compartments replace the traditional cube shaped mailbox compartments. The new minimum size requirement is 12′′w × 15′′d × 3′′h. Parcel Lockers – fully integrated parcel lockers with a minimum of one parcel locker per 10 tenant mailbox compartments. Stand-alone parcel locker options are also available. Mailbox Security – strengthened security for the entire mailbox receptacle along with an improved, standardized tenant mailbox compartment lock design. ADA Compliant – compliant with the Americans with Disabilities Act (ADA). What about the USPS-STD-4B+ Standards? 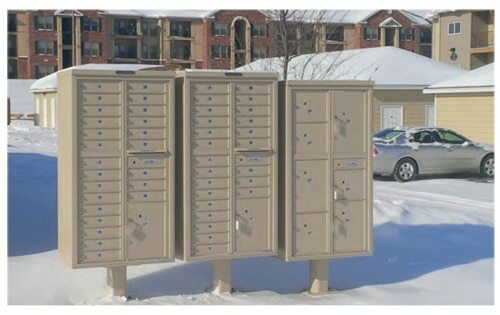 USPS STD 4B+ standards were developed to improve mailbox security to vertical and horizontal apartment complex mailboxes. The standards strengthened the arrow lock compartment on the mailbox master door of 4B+ mailboxes. You can view all Florence 4B+ mailboxes here, such as vertical commercial mailboxes like the Florence model 1250 or horizontal style apartment mailboxes (such as the Florence 1400 series). Note: The STD 4B+ mailboxes are only USPS approved for replacement purposes. It must be used to replace an indoor mailbox and use the approximate same rough opening. What is the process used to set USPS standards? The USPS analyzed various factors like mail size, volume of mail received, mail delivery efficiency, and other topics such as mail theft and vandalism. They forecasted the future needs of efficient mail delivery. They then formed an Apartment Consensus Committee. The committee was comprised of key players like mailbox manufacturers (ex. Auth Florence Manufacturing), mailbox service providers, resellers, property management companies, owners, and members of USPS. The Apartment Consensus Committee spent one year reviewing and discussing items 1 and 2. The Committee then set new mailbox requirements referred to as “STD-4C Regulations,” which are now mandatory for all centralized mail delivery through the USPS. Why did the USPS set new 4C standards? The new standards are designed to improve mail service. Should I expect mailbox regulations to change again soon? We can expect the new 4C standards to be in place for multiple decades. The last set of USPS mailbox standards were set in 1975 and were used for 30 years. These standards were able to withstand drastic increases in mail delivery. Since setting and implementing new standards is neither quick nor easy, the USPS strives to ensure the standards are able to protect and manage future mail trends. Does my mailbox meet USPS requirements? You will find a USPS Approved Logo on each Florence Manufacturing 4C mailbox that meets the new STD-4C mailbox requirements. You will find a wide range of USPS approved community mailbox products online at The MailboxWorks. This includes the mix-and-match 4C modules used to create a versatile 4C mailbox suite configuration. As stated above, we highly recommend that you check with your local postmaster about mailbox requirements prior to starting your project. Is the manufacturer’s name labeled on the mailbox? Yes, you can typically find the manufacturer name on the front of the mailbox unit by the Outgoing Mail door or in one of the bottom corners.